Two BBC World News shows now shown on the BBC News Channel are getting a revamp from the beginning of August, with more overnight simulcasting while the changes take place. Newsday, primarily a breakfast news show for viewers in East Asia; the last two hours of which are now simulcast in the UK from midnight, is getting a whole new look from the beginning of August alongside Asia Business Report. A new bureau in Singapore becomes host to a brand new studio for both programmes. 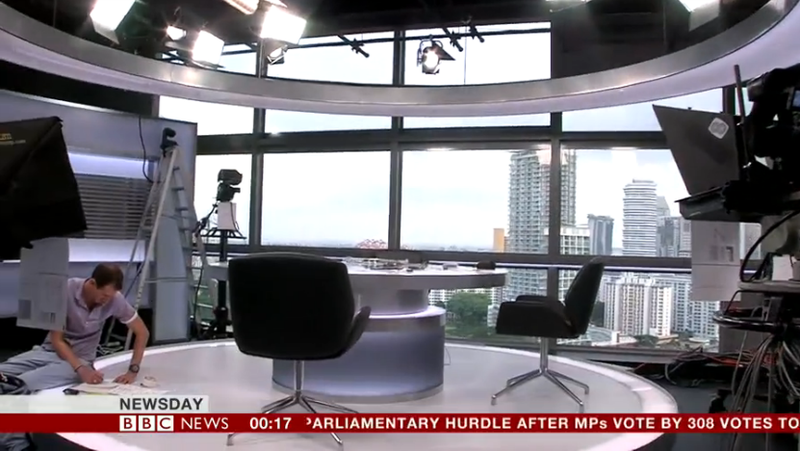 Earlier today, the BBC's Sharanjit Leyl gave viewers the first sneak preview of the new set (pictured). The opening of the new facility will mark 15 years of live BBC World News programmes from Singapore and will see all its broadcasts switch to HD. While the changes take place in Singapore, Newsday and Asia Business Report are being broadcast entirely from London. Following the temporary relocation of programmes to London, the BBC News Channel is now simulcasting Asia Business Report and Sport Today every hour through the night until 04:00, replacing previously scheduled feature programming at 00:30, 02:30 and 03:30, increasing the time periods when the UK channel is simulcasting with BBC World News. The daily review of proceedings in Parliament for the last days of the current parliamentary session has moved to weekday mornings at 04:30, with HARDtalk returning to the slot later this week. 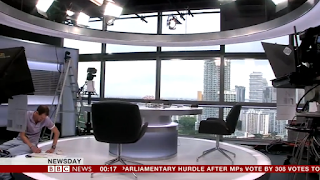 The move to increase the number of simulcast hours with BBC World News earlier this year prompted a lot of controversy and comments from viewers concerned about the BBC's ability to focus on developing UK stories in off-peak hours. Newsday itself has been critised by some viewers because of delays and long pauses between the London and Singapore presenters, with the programme apparantly suffering from a time-delay between the two locations. The midnight simulcast of Newsday replaced the last UK news bulletin of the day, mostly presented by Clive Myrie or Martine Croxall on the News Channel at the beginning of June. BBC World News is a commercially operated international channel. Piggybacking on the channel means the licence-fee funded BBC News Channel can reduce costs.